April 5, 2005. The Wabash Club of Chicago held its annual Scholarship dinner at Maggianos restaurant in Oakbrook, IL, a suburb west of Chicago. The group welcomed four prospective students and their families - two of the students announced at the dinner that they had decided to attend Wabash in the fall! 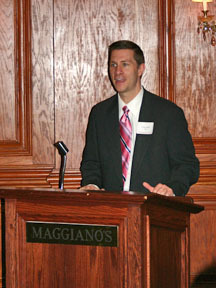 Greg Jania ‘93 served as the evening’s emcee. He introduced Wabash president Andy Ford H’03 before dinner. Andy welcomed the group, thanked them for their continued support, and also gave them a quick update on the College. After a great dinner, Steve Marcou ‘93, senior assistant director of Admissions, introduced the four future students and the evening’s speaker, JD Phillips. 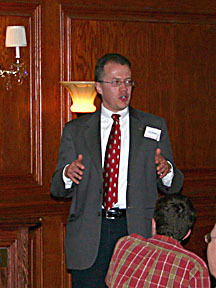 JD is a professor of Math and Department chairman for Math and Computer Science. JD explained to the group the concept of Wabash’s immersion trips and showed photographs from the trips student took to Ecuador and the Czech Republic in the past year. The group - which included alumni, parents, and the prospective students - came away with a newfound appreciation with the opportunities available at Wabash today. Many thanks to Andy Ford and JD Phillips for their presentations and to Greg Jania, Steve Marcou, and Mike Warren ‘93, from Alumni and Parent Relations, for putting the event together. Photos: Top: Greg Jania '93. Bottom: Professor JD Phillips.